On the accession of Charles I., the farthing tokens were again proclaimed as lawful currency, and the counterfeiting of them discouraged, and on the 11th of July, 1626, a patent was granted for seventeen years to the Dowager Duchess of Richmond, and Sir Francis Crane. 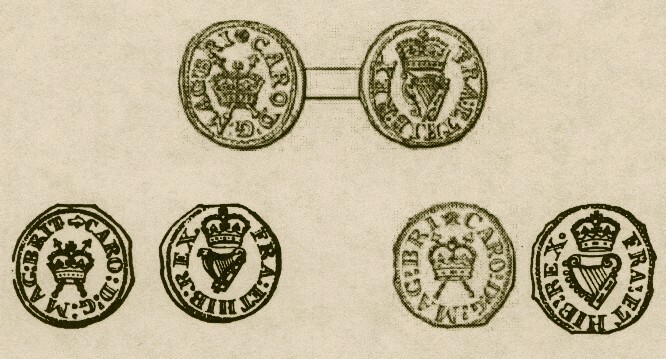 The first tokens of Charles I. resembled those of his father. 1. O. A crown over two sceptres in saltire. CARO. D. G. MAG. BRI. (or BRIT. R. A harp crowned. FRA. ET. HIB. REX. Common. In my cabinet is an example with m. m. rose on the obverse only, but the crown on both sides is wide, flat and double-arched as on No. 3, described hereafter. Mr. Caldecott has another example with the m. m. harp. On another in my cabinet the m. m. cross appears on both sides, but as the word REX in the reverse legend appears as RE, the m. m. on the reverse may have been inserted in error for the letter X. There are some few other mintmarks which are not capable of attribution to any defined object or symbol; but as there were so many forgeries at this period these may be distorted representatives of some of the mint marks above described. One variety reads CARA. and BRIT. m. m. rose, and I have seen CARA. on another of these pieces, but these also may be forgeries of the period. These tokens are sometimes found on square flans, and as strips of these have occurred (almost always with the m. m. rose) it is most probable, as before stated when dealing with the similar tokens in the last reign, that they were all struck on narrow strips of copper and cut out afterwards. A silver proof, reading BRI and with m. m. cross occurs in the Imperial Collection at Vienna. The shape of the harp differs on various coins. It is sometimes with the bird's head and sometimes without. The next variety, which is much rarer, is generally more oval in shape, and the legend commences at the bottom, preceded by the mint mark. The latter is sometimes placed between the stems of the sceptres. In other respects this variety resembles the last. I have only observed BRI, and very rarely BR, but never BRIT on this variety, MA sometimes occurs instead of MAG. A further variety, which may be attributed to this series, reads Obv: CAROLVS. D'. G'. MAG. BRI. A double arched crown with two sceptres in saltire. The handles of the sceptres extend to the lower edge of the coin and enclose the m. m. fleur de lys. Rev: FRAN'. ET. HIB'. REX followed by the m. m. fleur de lys which has a pellet on either side of it. A double arched crown surmounts a harp decorated with a bird's head. This piece is oval in shape, has a beaded border on both sides, and weighs about 7 2/3 grains. It differs, but in very minor details, from the one described in Snelling, Copp. Coinage, Section II., p. 5, Engraving C.
Later in the reign an inner circle was adopted, and more care was exhibited in the workmanship. These tokens are scarcer than those without the inner circle, but are not rare. 3. O. A crown over two sceptres in saltire. CAROLVS. D.G. MAG. BRIT. Inner circle. R. A harp crowned. FRAN. ET. HIB. REX. Inner circle. In my collection is an example with m. m. woolpack on the obverse and no mint mark on the reverse. In consequence of the gross abuses in connection with these tokens, and the facilities afforded thereby to forgeries, a new farthing token, now sometimes called the rose or royal farthing, was issued in the year 1635. It was coined in copper, but was sometimes composed of two metals, the more easily, as it was stated, to avoid counterfeits. These pieces were thicker and heavier than the last, and a rose was substituted for the harp on the reverse. There are three distinct types. 4. O. CAROLV. D. G. MA. (or MAG.) BR. (or BRI). A single arched crown above two sceptres placed horizontally in saltire. Inner circle through which the ends of the sceptres pass. R. FRA. ET. HIB. REX. A single rose surmounted by a single arched crown. The only m. m. is that of a mullet on both sides. R. 5. In the National Collection is one of this type with m. m. crescent on the obverse, but no m. m. at all on the reverse, and in the same collection is a specimen in silver with the lys mint mark, and which was, no doubt, a trial piece intermediate between this and the next described variety. In some, the inner circle is more or less apparent, and this has probably led to the belief that there is one variety in which the inner circle is wanting altogether. 6. The third variety has the name of CAROLVS at full length, and is of neater workmanship. This variety has always the double rose, and the crown on both sides is double arched. The lettering is sometimes large and sometimes small, and on one example belonging to Mr. Caldecott with the m. m. lys on the obverse, the reverse reads FRAN'. ET. HIBE'. REX. I have a farthing of this variety which has no mint mark at all on either side, and there are two others, differing in details, in the cabinet of Mr. Caldecott, one of which reads HIBER; these are of very fine work and somewhat suggestive of the style of Briot. A further example has the ordinary obverse m. m. lys and the reverse of fine work reading HIBER and with no m. m. There are specimens transitionary between the second and third varieties, which have the obverse of the one and the reverse of the other. In my cabinet (ex Coll. C. H. Nash) is a farthing of which an engraving is given below, and which is of very fine workmanship, and different from any of the foregoing. It is probably a pattern. The rose is very large as is also the crown surmounting it, and which latter is more than usually arched. The sceptres on the obverse are wholly within the inner circle. The mint mark on both sides is a fleur de lys. The first pattern that should be described is in silver, and does not, I believe, occur elsewhere than in the National Collection. It resembles, but was evidently intended to be an improvement upon, the Harrington tokens. 1. O. CAROLVS. D. G. MAG. BRITANN. A double arched crown and the sceptres entirely within an inner circle. No m. m.
R. FRAN. ET. HIBER. REX. The harp crowned within an inner circle through which the crown penetrates. A small B (for Briot) after REX. R. 8. Another pattern in copper resembling the later royal farthings is in the cabinet of Mr. Caldecott. 1A. O. CARO D'. G'. MA: BRI: A single arched crown. R. FRA'. ET. HIB'. REX. Two sceptres in saltire. The sceptres have crowned heads and rounded bases. There is a mint mark on both sides, but so rubbed as not to be able to be defined. Weight 15¾ grains. Attempts were made to remedy the evils caused by the smallness and insignificant value of the tokens above referred to, and several patterns have reached our time. The first of these is a piece about the size of the current farthing of Charles II. It is of pure copper. 2. O. FARTHING. TOAKENS. (Snell: Copper Coins, Pl. 6, No. 1, wrongly spelt TOKENS). A crowned rose over two sceptres in saltire. In each of the three lower angles made by the sceptres, a large fleur de lys. R. TYPVS. MONETAE. ANGL. AERIS. A crown over two sceptres in saltire. In each of the three lower angles, a lion passant to the left. R. 8. This is most probably the work of Nicholas Briot, and of the same date as his pattern shilling bearing a similar inscription. I know of only two examples, one in the National Collection, from the Devonshire Sale (Lot 296), and the other in my own, from the Hollis, Durrant, Sparkes, and Brice Collections. 3. Mr. J. H. Burn, in his Introductory Memoranda to the London Tradesmen's Tokens, in the Beaufoy Cabinet, mentions another pattern with the reverse from the same die as the last, but having on the obverse "CITTIE OF LONDON"; the device being a rose crowned between two swords, the points downward, and dated 1644. He asserts that this was in the Devonshire Cabinet, and probably passed thence into the British Museum; but the Devonshire coin was of the above described type 2. In the National Collection is certainly the CITTIE OF LONDON piece, which is probably unique, and was purchased at the Trattle Sale (Lot 1526). 4. O. CAROLVS. D. G. M. B. REX. m. m. lys. A crowned rose between C. R. within an inner circle. R. A. FARTHING. PLEDGE. Same as obverse, and with same mint mark. R. 6. 5. O. CAROLVS. D. G. MAG. BRIT. REX. The legend commences at the bottom of this coin. Within an inner circle the king's bust in armour and with an ornamented helmet. R. FRA. ET. HIBER. REX. The royal arms in an oval garnished shield within an inner circle extending only round the lower half of the coin, within which is the legend. Before and after the latter is a rose. The above coin is of the same size as the farthing tokens which bear the harp, and seems to have been a pattern for a similar currency. There is a specimen in my own collection, and also in the National Collection. 6. A copper pattern of a larger size, which has been stated to be that of a coin, specimens of which exist in the National Collection and in my own, has on both sides three crowns connected by a knot, but is without any legend. The workmanship is fine, and the piece probably more of the nature of a jetton. O. PRAY. FOR. THE. KING. The words separated by interlaced knots [quatrefoil-like figure]. In an inner circle, a crowned rose between C. R.
R. LORD-GIVE THY-BLESING., in three lines. Above the word LORD and beneath the word BLESING is an interlaced knot between two roses. extending only round the lower half of the coin, within which is the legend. Before and after the latter is a rose. It is possible that this piece also is a jetton struck on or after the execution of the king. The following pieces are usually described as half groats, and are included in the series of silver coins, or rather patterns for silver coins. Their weight, in silver, however, varies from 21 to 30 grains, and I prefer to treat them as patterns for copper coins, particularly as two, at all events, occur in copper or brass. It may generally be laid down as a rule that, when a coin, concerning which we have no direct information, occurs in two metals, the lower metal most often represents its true position. Thus we have many proofs in silver, and sometimes in gold, of copper coins; while proofs in silver of gold coins, and in copper of silver coins, rarely occur. There are, of course, exceptions; but the comparative rarity of the coin in the one or the other metal has no bearing upon the question. Silver specimens of Queen Elizabeth's "PLEDGE OF A PENNY" are far more common than copper ones. The "QVATVOR MARIA VINDICO" farthings are more common in silver, and many other instance will occur to the collector. 8. O. CAR. D. G. MAG. BRIT. FRAN. ET. HI. R. the king's bust bareheaded, with a ruff, m. m. lozenge. R. FIDEI DEFENSOR. Two C's interlaced, surmounted by a crown; under the cyphers, a small B. An inner circle on obv. and rev. R. 3. in silver, R. 8 in copper or brass. This is by Briot, whose half-groat weighs 14 grains, whereas this, when in silver, weighs 27 or 28 grains. I have one in brass in my collection which weighs 31 grains. 9. O. CAR. D. G. ANG. SCO. FR. ET. HIB. REX. Otherwise as No. 8. R. Same as No. 8, but there is a lozenge under and on each side of the interlaced C's, and there is no B under them. I have seen this in silver only. 10. O. CAR. D. G. ANG. SCO. FR. ET. HIB. REX. m. m. a small lozenge. The king's profile bust with large ruff. R. FLOREBIT. IN. AEVUM. A full-blown rose, irradiated, m. m. rose. R. 5. A specimen of this in gold is in the National Collection. It otherwise occurs in silver only. 11. O. CAR. D. G. MAG. BRIT. FR. ET. HIBER. m. m. rose, king's head in profile with large ruff. R. REGIT. VNVS. VTROQVE. m. m. rose, a sceptre and trident united by a triple knot between a C. on each side, crowned. R. 5. This also occurs in silver only. I have a specimen in my own collection of unusual thickness, weighing 54 grains. In common with the above pieces it would appear to be the work of Nicholas Briot. 12. O. CAR. D. G. ANG. SCO. FR. ET. HIB. REX. Otherwise as No. 11. 12A. O. As No. 10. 13. O. CAR. D. G. MAG. BRIT. FR. ET. HI. R. m. m. lozenge. C crowned in the field. Under the C, and on both sides of it, is a small lozenge, though these do not appear in Snelling's plate. R. Same as No. 10 and with the same m. m., but the rose is not irradiated. This coin is in the National Collection, and is of some importance, as it is one-half the size of the ordinary piece, and although it does not alter my own opinion it favours the arguments of those who would contend that the interlaced C's on pattern No. 8. refer to the denomination of the pieces, and prove it to be a half-groat, in which case the present pattern would represent a design for a penny. I have lately secured an example of this type on which the rose is irradiated. Though somewhat rubbed, it weighs 15 grains, which is about the weight of the half-groat of that period. 14. O. A rose, surmounted by a large crown, and between C. R. both crowned. Under the rose is a small B. for Briot. R. A crowned thistle between C. R. both crowned. Under the thistle, 1640. Weight 23 grains R. 5 in silver, R. 8 in copper. This also occurs in silver, but a specimen in copper is in the National Collection. In my own collection is a silver pattern for a halfpenny, which has not been before (at all events, accurately) described. It weighs 8 grains. 15. O. CAROLVS. REX. A full blown rose in an inner circle, crowned, between C. R.
R. A. HALF. PENI. Same design as on obverse. The m. m. is a small fleur de lys on both sides. R. 7. An example of the above piece occurred also in the Brice Collection. There is one very similar to this represented in Snell. Patt. pl. 5, No. 19, but without C. R. on either side, and reading A HALF PENNY. I have not been able to trace any such piece, which is probably a blundered representation of the coin above described. In the National Collection, and in mine also, is a silver pattern for a halfpenny, weighing 42 grains. R. FRAN. ET. HIBER. REX. In the field is + C. ½D R. surmounted by a large crown. R. 8. This appears in Snell. Patt. Plate 5, No. 21, but the small B is omitted, and he refers to the coin as being of mixed metal; mine is certainly of silver. He also expresses his opinion that, owing to the form of the crown, which is unique, it was coined after the king's death; but this is more than doubtful. The weight of this piece and of the others before described is important, as showing, with regard to patterns struck in metals other than that of the intended current issue, that no fixed weight was employed, and this also indirectly proves that these were all, with greater probability, patterns for a copper coinage. I have another pattern in copper, a very worn example of which is also in the National Collection, and which I believe does not occur elsewhere. 17. O. P. KING. ET. PARLIAMENT. The king's head in profile to the left, crowned. The king's hair is long and curling, and falls over the shoulder. R. A stem of rose and one of the thistle interlaced, surmounted by a small crown, which is between the letters C. R. R. 8. The inscription on this coin is singular. The P. probably stands for PRO. The weight of the piece, which is extraordinarily thick, but not of larger module than the Briot pieces, is 102 grains. In my cabinet is a copper piece of the size of a modern halfpenny; the obverse is plain but the reverse bears the stems of a rose and thistle intertwined and crowned, similar in style and design to the last described coin, and apparently by the same engraver.